My office is in a spare bedroom in the basement. It’s far larger than a corporate cubicle—as I recall from when I could find the tape measure, it’s 10 by 11 feet—and it’s full of computer equipment, books, a space heater, and three wastepaper baskets (one for office paper to be recycled, one for junk mail to be recycled, and one for actual trash). I spend a lot of time here. 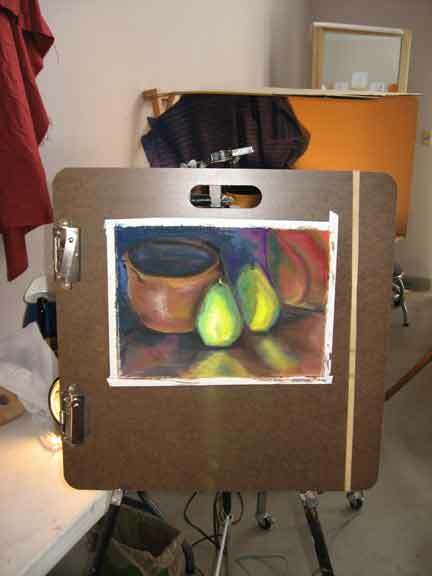 For a while, in 2000 through 2002, I got out pretty often to take painting workshops and do figure drawing. I loved it. The frequency with which I did this decreased dramatically in 2003, when Priscilla Gibson-Roberts conveyed Nomad Press into my keeping. It’s not as easy to arrange that change of perspectives as it used to be. 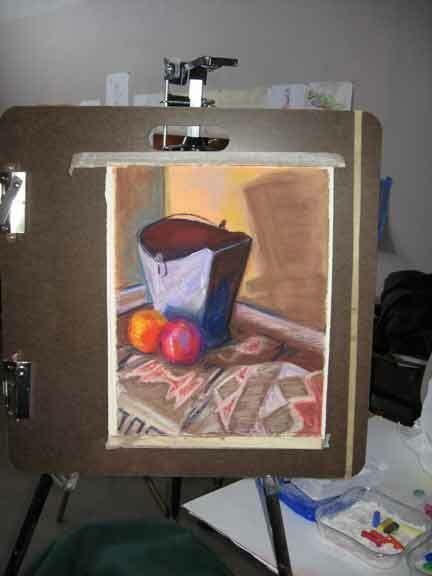 But Thursday and Friday this week, I signed up for a workshop in painting with pastels (which I’d never used) being given by Rick Stoner at the Loveland Art Academy. Wow, did I enjoy spending chunks of two days working with my eyes and not my brain. One of Rick’s refrains to all of us: “You’re thinking too much.” (I tend to think too much.) And a new medium! Pastels are pure color. 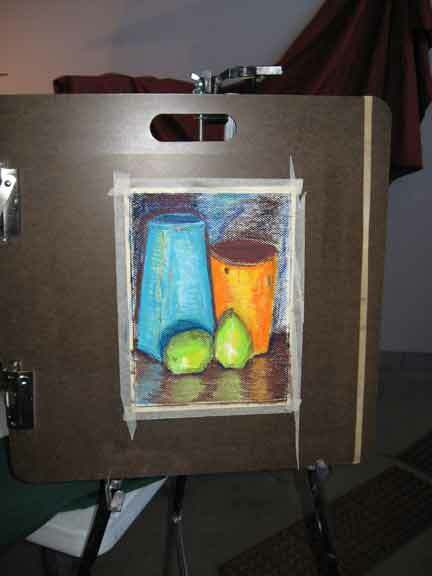 The images below are workshop pieces. I don’t think they were particularly successful, but I learned a lot by making them happen. I made these two on the first day. The image below took most of the second day and acted as a patience builder. It didn’t work, and didn’t work, and didn’t work, but I kept at it and in the long run it was better at the end than it was at the beginning or halfway through. 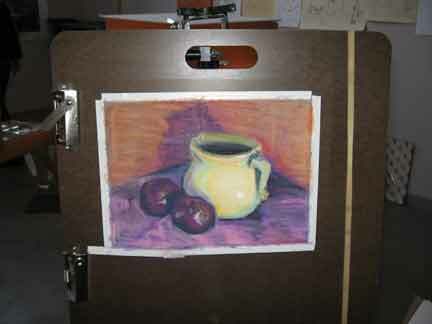 For the final painting, I had only a bit over an hour left. I was not about to waste that much time, but since the previous piece had taken about five hours I knew I wouldn’t get far with sixty minutes. I had to leave promptly at the end of the workshop to rendezvous with a freight delivery. So I shifted from the smooth to the textured (wire) side of the paper to see what that was like. Beyond the first laydown of color (which was amusing), I didn’t enjoy the texture. So now I know. The other thing that happened on Friday was that the fourth printing of Arctic Lace got delivered. We'd expected it all week, and it finally showed up. Between 7 and 8:15 a.m., I got the timing roughly coordinated with the local Roadway dispatcher. When I arrived home at 4:30, the truck was parked in front of the house. Usually I end up transferring boxes from the back of the truck to my hand truck at the curb, then hauling them up to the garage four or five at a time. This truck was equipped with a liftgate. 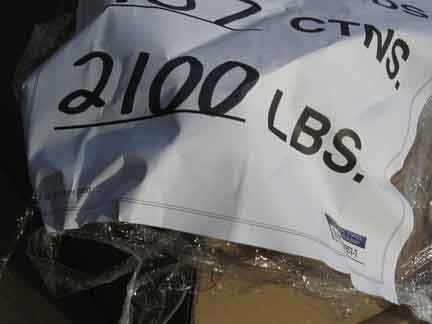 The driver could move the whole pallet off the truck with a pallet jack. 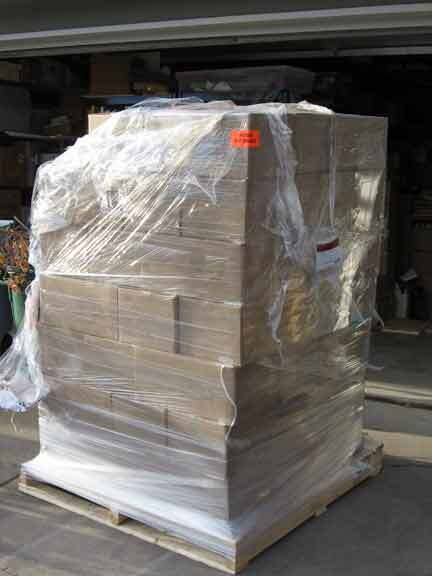 With the boxes still on the pallet and levitated by the pallet jack, he pulled and I pushed the stack uphill . . . with me hoping and trusting that the solid block of books would not fall back on me. By 4:50, we had all the boxes within ten feet of where they needed to be. That's fast for moving 57 boxes of books. Then he left. This was his last delivery ever. He’s changing to management. I only thought to snap the photo below after I'd already begun to strip off the pallet wrap and had removed a half-dozen cartons or so. Yes, that's the top of the garage door above the pile. The pallet is about four feet across. Earlier this week, someone with whom I was consulting for help in counteracting some of the physical stresses of too much computer work asked if I'd be open to adding weight lifting to my normal exercise routine, which consists of walking and yoga. She said the weights would help build my trapezius and rhomboid muscles, which might in turn ameliorate some of the problems I’ve been having. I said I would be open to that, and that I think my daughter, who lifts free weights regularly and is up to twenty-pound weights, might have some five-pounders I could start with. Except for making phone calls and setting up the shipments, I stayed out of the basement all day. Soon: more Norsk Strikkedesign-inspired knitting progress. I'm part of the Ten Zen Seconds Group. I was so excited to see that you know Donna and Susan. I know them from Women Writing the West. Your pastels are lovely. And, you are awesome, juggling so many activities...from the big picture to the details. 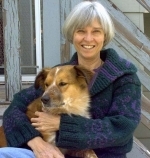 Janet Grace Riehl, author, "Sightlines: A Poet's Diary"